Side note: Even if you don’t color your hair, if you’re one of those people who loves your flat iron and also can’t remember if you got a haircut in 2013, these tips are for you. Can you have dyed hair and healthy hair? Is it a real thing or a unicorn? Grab a seat, because first, we need to sit down for some straight talk. Once you put any color on your hair, you’ve changed the structure of your hair. So until that colored hair grows out, it will never be the same texture again. Now, this isn’t necessarily a bad thing. Most people find that after coloring their hair, it has more volume and holds style better. But if you were a wash-and-go kind of gal before, whose hair always dried perfectly, then you might have to put a little more effort into getting that smooth texture. A by a little, I mean a lot. Kidding, kidding, kidding. But definitely more effort. 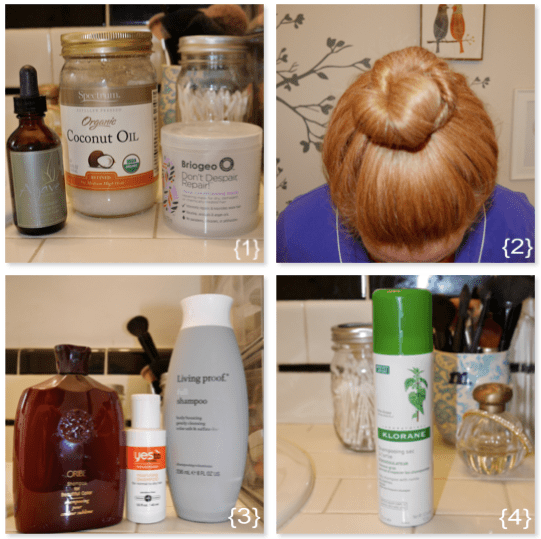 Your hair is going to feel different. Bottom line. Alright, let’s stand up and shake hands. You took that well. Now let’s get some hair tips going. 1. Put coconut oil on your ends before your shower. Yep, the cooking oil. It’s also an inexpensive hair miracle. This is one of my favorite tips, but I will be honest, I forget to do this more often than I do it. I need to put the coconut oil in a cute jar so I can keep it on my bathroom counter so I don’t forget. But…I digress. 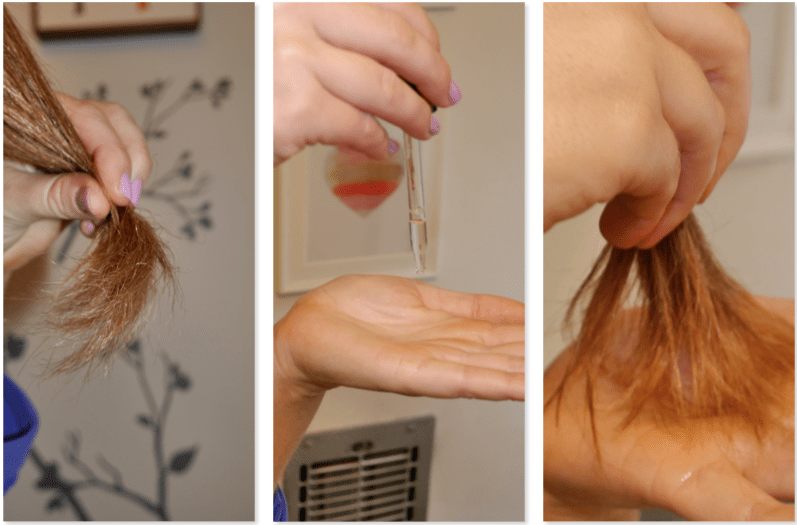 Putting the oil on your ends conditions the dry ends of your hair that don’t get all the oil from your scalp. Also, it protects your hair from shampoo. You don’t need shampoo on your ends generally unless you’ve used a ton of hair spray or other products. So this will protect delicate ends from getting any more dried out. Put oil on your ends 5 minutes before you shower for extra dry ends or right before if you’re like me and forgot to do it 5 minutes before. Then shampoo and condition normally. Your hair will be so silky when it’s dry. Make sure to put the oil in the 1-3 bottom inches of hair only, any higher will just make the rest of your hair look greasy. 2. Sleep with your hair in a bun. It reduces the amount your ends rub against your pillow and you’ll have less breakage. 4. Dry Shampoo. I swear by it. The least amount of washing your hair keeps it healthy by letting your natural oils do their work. Also, the less you wash your hair, the less you have to heat style it after. And the healthier it shall get. 5. This is my least favorite tip, but, it works. Don’t heat style your hair for as long as you can. No flat irons, blow driers, or curling irons. Try to limit it to once a week at least. There’s nothing I love more than getting some spiral curls up in my hair, but holy heck when I take a week off from using heat I notice a HUGE difference. 6. Turn your ends into a paintbrush. An oil paintbrush. Trust me, I am sober and I will explain. When I run my oil through my ends, its comes out nice and sheer. Which is great for every day. But when my ends are super dry and damaged, it ain’t enough. Paintbrush time. I hold all my ends together at the bottom so the ends of my hair look like a paint brush. Then I put oil into the palm of my hands and swirl the ends of my hair around until the oil is absorbed. I either use coconut oil or Agave oil. Your ends will look kind of crazy for a minute, but then the dry ends soak all the oil up and you’ll realize miracles happen every day. You just have to keep your eyes open. Bonus Tip You Probably Already Know: Deep condition once a week. Get yourself a fancy mask and just go for it. I just started using one from Briogeo, $26, and I love it. It’s a perfect weekly deep conditioner because it adds a ton of moisture without weighing my hair down. After I use it my hair feels awesome and I don’t want to cry every time I try and run my fingers through it. I also used one from Ojon, $33, when I burnt my hair by using a curling iron that was too hot. I thought I was going to have to cut a chunk of hair out of the middle of the back my head. For real. I cried real tears, real actual tears, because I’m shallow and didn’t want to have a weird missing chunk of hair. Then I left this mask, which starts out a super thick, goopy balm and warms in your hands into a smooth paste, on my hair for 6 hours (you only have to leave it on for 30 min normally, but…burnt hair). I ran errands, went to the supermarket, went everywhere looking full-on crazy but I didn’t care. Because, TA-DA, that mask saved my hair and I didn’t have to cut the burnt chunk out. After rinsing that mask out, my hair looked like it had never been near a curling iron in it’s life. I had shampoo commercial hair. I wish I could play that super dramatic music they play in movies over that sentence, but you get the point. Miracles, you guys, they’re all around us. 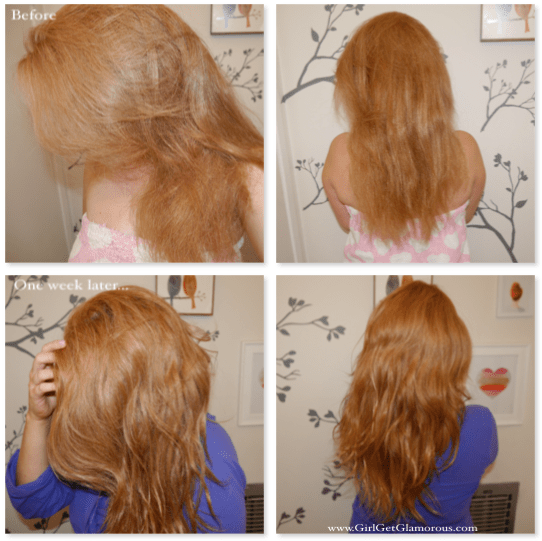 The Ojon mask is nothing short of a miracle for really damaged, about-to-cut-it-all-off hair. This is also a good trick for your extensions if you have them. Deep conditioning them will help them last longer, so you don’t have fried ends on fake ends. Haha! Ok. I’m done here. Also, go see your hairdresser in 2014. They miss you. Thank you for reading! Please share this post on your Facebook page. Your friends will thank you. Trust me. Just wanted to say that I LOVE your blog! The first post I ever saw from you was the strawberry blonde journey part 2 and thought it looked absolutely beautiful on you that I had to try it out. The roots spray that you mentioned here, is it useful for people that don’t have grey roots? I have a dirty blonde/very lgiht brown natural under the red and would love to use it between colouring. Thank you so much, that’s really nice of you to say and I’m glad you like the blog! How did your color turn out? I’m all grey, so I checked the Sephora website and the Rita Hazan description says it only covers greys, not new growth. But maybe try in the next time you are at a Sephora or Ulta? It’s worth a shot!